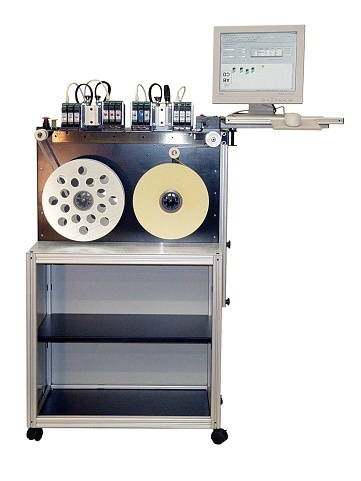 The LPx machine is roll to roll label printer. This configuration is typically found in Newspaper applications. Where the notes are used for front page advertising. Digital speed control allows for the smooth unwinding and rewinding of the heavy rolls. Flexible Imager deck. Mount from 1 to 4 standard or automatic capping imagers or combinations of single pen modules. Built in cabinet with heavy duty casters and steel construction and lap top stand. Print accurate to the pixel level across all imagers. Height 55 in, depth 20 in. length 30 in. Electrical 120 VAC 6 amps 60 Hz. 230 VAC 3 amps 50 Hz. Material: Label size 1 x 1 in to 4 x 5 in. Continuous roll with nominal gap between labels. Label material may vary with different inks, typical plain paper 18-20 lb bond. Label roll 3 in core, 12 in roll. Printing speed electrically controlled at 25 inches per sec. Production rate varies with label length. Data transfer via Ethernet cable. Typical resolution 300 dpi horiz. 600 dpi vertical. Can print up to 600 x 600 dpi. Design software included. Requires current Windows system. 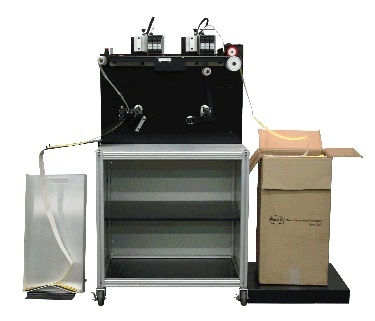 Fan fold label transport with re-stack tray.